Have you ever brought your phone to the toilet? Truth is, most of us are guilty! The thing about pocket technology is that it goes where ever you go, including the toilet. Maybe you leave it on top of the paper towel dispenser or just put it near the sink – either way, your phone is getting covered in bacteria. What is especially unsanitary about it is how close you put it to your face and mouth on a regular basis. Remember, your phone is exposed to everything you touch. You might wash your hands all the time but that is not always enough. Sure, you wash your hands after using the bathroom, but how often do you wipe down your phone? Did you know that the build-up of bacteria on your phone could be giving you acne or causing blackheads to develop on your face? Or worse, it can get you sick. The germs on your phone can be as harmful as E.Coli, Staph, and MRSA. However, we still rarely remember to disinfect our phones or phone cases. If you live in a warm place like Australia, the warmth will facilitate the spread of bacteria, along with your phone warming up as you use it. While it is unlikely that reading this will make you keep your phone out of the toilet or kitchen – we hope this will remind you to keep it a little cleaner. Just keep in mind how many things you touch during the day, and how filthy your phone can get as a result of that. Practice washing your hands frequently throughout the day but remember to give your phone a daily wipe down with some disinfecting wipes just as often. Oh and don’t forget to change your phone cover and screen protector every couple of months too! https://www.rapidhygiene.com.au/wp-content/uploads/2018/03/How-dirty-is-your-mobile-phone_-1.png 788 940 Rapid Hygiene https://www.rapidhygiene.com.au/wp-content/uploads/2017/09/400-logo.png Rapid Hygiene2018-03-16 11:30:352018-03-16 11:30:35How dirty is your phone? This might not be the most talked about topic around the office, actually, it is probably the last topic of conversation to arise while you wait for the coffee van or eat your lunch, but we should shed some light on feminine hygiene in the workplace. Women who work in typically male-dominated occupations, specifically, find that the bathrooms very rarely have any sanitary bins, in particular, ones that are regularly emptied or serviced. This can cause a lot of added discomfort to an already unpleasant situation for the female worker. Workshops are another example. They often employ mostly male workers and don’t have bathroom facilities which cater to women. This can be very discouraging for women who work in the trade industry, construction industry or similar. Portable toilet suppliers generally do not consider the female workers on site either so it is very rare to find a regular bin in a portable toilet, let alone a sanitary bin. Providing your female staff or customers with a discreet and hygienic place to dispose of feminine hygiene waste is crucial to maintaining a clean and pleasant washroom environment. Providing adequate sanitary bins should be a high priority in any work regardless of how many females are employed at the organization. How can Rapid Hygiene help? We offer sleek, modern and discrete feminine hygiene solutions. Our femcare sanitary disposal units are available in either manual or touchless and can fit easily into various bathroom designs due to their slim design. Our femcare disposal unit uses a double-lined system for extra protection & odor elimination and is made of biodegradable materials. We can supply your office with the trusted solution to feminine hygiene. Our service staff are easy going and flexible and will fully service, maintain and sanitize the units. We would love to find out how we can help your office, call us on 1800 92 77 92 to discuss your options. Recently I Started A New Job. When I Went To The Bathroom, There Was A Big Problem. 2018. Mamamia. https://www.mamamia.com.au/sanitary-bins-every-bathroom/. McLaren, Rebecca, and Emilia Terzon. 2015. “Toilets And Tampons: The Female Facilities Gap In Blokey Workplaces”. ABC News. http://www.abc.net.au/news/2015-11-16/toilet-concerns-for-nt-women-in-blokey-workplaces/6939082. We all know the obvious places where you expect to find germs and bacteria. The floor, door handles, and the toilet seat are all an easy guess, but we have listed some more unexpected areas that you might be surprised aren’t as clean as you might think. Chances are that you take your mobile phone with you everywhere you go, some people can’t even go to the toilet without taking their phone. All of the germs on the things we touch throughout the day such as door handles, shopping trolleys, and fuel pumps – get transferred to our phones the instant we pick them up. We use our phones while eating on our lunch break, meaning food residue can get on our phones. We might wash our hands after we eat, but we pick up the same dirty mobile phone! We suggest wiping down your phone on a regular basis! This is not your typical item that is considered to contain a lot of germs. However, your belt is usually the first thing that you touch when you go to the bathroom! So make sure that, much like your mobile phone, you give your belt a regular wipe down, especially the buckle. It is really important that everyone cleans up after themselves in the office. Communal kitchens can be a breeding ground for bacteria. Simple things like resealing food in containers, checking the fridge for food that is going off, covering food in the microwave and wiping down the benches can make a huge difference in maintaining the hygiene standards in your office kitchen. Many offices have water coolers, but can they make you sick? Studies show that shared water coolers can be an easy way for germs & bacteria to spread across the office. That means that an annoying cough your co-worker is experiencing could soon become your cough! To prevent this from happening, it is a good idea to wipe down the tap at the end of each day. Your handbag is another offender for gathering germs and bacteria. If you take the bus or train to work every day, you probably place your bag on the bench next to you. Handbags are also often placed on floors and chairs in public areas. Instead of placing your bag on floors try to use a hook whenever there is one available. If there are none available and you are traveling, it might be better to keep your handbag on your lap. 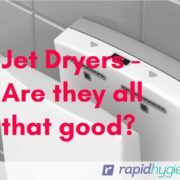 https://www.rapidhygiene.com.au/wp-content/uploads/2017/09/Jet-dryers-blog-pic-1.jpg 788 940 Rapid Hygiene https://www.rapidhygiene.com.au/wp-content/uploads/2017/09/400-logo.png Rapid Hygiene2017-09-18 14:27:142017-09-18 14:53:08Jet Air Dryers - Are They Hygienic? Maintaining a clean workplace is not always the easiest task, especially in a busy office or showroom. That being said, it is worthwhile investing in cleaning services and products which prevent the spread of germs. The office is often a breeding ground for the common cold, especially during the colder months. Keep your employee’s flu free by taking control of your commercial hygiene. It’s impossible to be completely bacteria free, but you can try and take steps towards a cleaner, healthier workplace. So, how do you keep your workplace clean as a whistle? If you work in an office – sanitizing wipes are a great way to quickly and effortlessly clean up your work station. The great thing about these types of wipes is that they are individually packaged so it means you can carry them in your pocket or purse. They are also very easy to dispose of. If you have a company car – especially one that you might share, it is a good idea to wipe down the steering wheel every occasionally. The staff kitchen can host a variety of germs and daily wipe down of the benches usually isn’t enough. Don’t forget to wipe down any handles and cupboards with hot water on a regular basis. Fridges should be completely emptied out to check for any rotten or expired food that someone might have forgotten to eat. Coffee machines also cause a fair bit of mess and the area should be cleaned very thoroughly. Other commonly used items such as printers, scanners, even coffee machines & microwaves tend to be a place where bacteria are built up. These sorts of areas need to be cleaned everyday– not just wiped down. 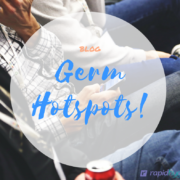 Other than spreading awareness of the threats of an unhygienic workplace, you need to make sure that your employees have everything they need to keep the spread of germs, dust, and bacteria from spreading everywhere. The obvious place to start is the staff bathrooms. Ensuring they are well stocked with paper towels, hand dryers and soap means that everyone can wash their hands. Soap commonly runs out quickly so it is important that you have enough stock to keep the dispensers full during the working week. Luckily Rapid Hygiene can help with that with our wide range of soap and paper towel dispensers. https://www.rapidhygiene.com.au/wp-content/uploads/2017/09/How-clean-is-your-work-space.jpg 788 940 Rapid Hygiene https://www.rapidhygiene.com.au/wp-content/uploads/2017/09/400-logo.png Rapid Hygiene2017-09-11 12:43:562017-09-18 13:45:24How Clean is Your Workplace? A recent survey has found 94% of adults would avoid a business if they encountered a filthy bathroom, especially if that business is a restaurant or hotel. So, it is obvious that the state of your bathroom has a huge impact on the reputation of your business. Here are a few tips to help you make sure that your customers are happy with what they see when they enter the bathroom at your premises. This is easiest and most simple way to stop mess and most importantly the spread of germs. Touchless devices such as faucets, soap dispensers hand dryers, and paper towel dispensers may require additional investment, however, will create additional benefits for years to come. Touchless fixtures offer great energy efficiency and the ability to reduce costs because they only turn on when someone is using them. Touchless fixtures are also great for preventing cross contamination. A soapy mess all over counter tops doesn’t leave the best impression about the cleanliness of your bathrooms. Liquid soap from the super market is the worst offender for causing this type of mess. Liquid soap dispensers tend to leave a soap trail all over the sink which does not look good to your guests. The best option is a touch free foam dispenser rather than a liquid dispenser to minimise the mess. You can also consider hand sanitizer gel to help stop the spread of germs. Restroom functionality is important to improve the user experience for your clients or guests. For example, countertops and toilets should be the proper height. Generally, counter tops should be 34 inches high so that they can easily be reached by most people. Ensure that paper towel dispenser’s, soap dispensers, and sanitary bins are easy to see and go with logical movement flow. Paying attention to some of these simple steps will go a long way to guarantee that your guests leave with a good impression of your business. Luckily you can leave the worrying to Rapid Hygiene who will take care of all the business regarding your restroom hygiene – so you can worry about taking care of your business. If your facility is an older one, it is should be a priority that the bathrooms are included in any renovations so they don’t begin to look outdated. Any signs of wear and tear should be attended too. Touch-Free soup dispensers, sanitary bins, hand towel dispensers and touch free faucets are all great for stopping the spread of germs and bacteria. Using touch free products is not only good for the customers, but it is also great for the business owner. They can reduce the wastage of water and paper which can contribute to maintaining a green building. Another important characteristic your users will recognize is an odor. A well-kept bathroom should have a pleasant fragrance that isn’t too strong or over powering. Air fresheners which disperse smaller particles work best as the smell remains airborne for longer and less product is used. Another factor to remember is keeping your restrooms well stocked with all the supplies your customers might need. There is no point in having a fancy bathroom if there is never enough toilet paper, paper towels or soap. So, make sure that these are all regularly replenished. By following these steps, you can ensure that your customers leave your business with a good impression. Contact Rapid Hygiene to find out more about our product range. You will have full support by our highly trained staff who will make sure that all your hygiene requirements are met to an exceptional standard. Our sense of smell is one of the most powerful senses that we have. The smell of a familiar food or perfume can trigger some of our fondest memories. Likewise, the pleasant scent in a restaurant or store can lure us in. It has the power to change our mood and encourage us to buy products and services. 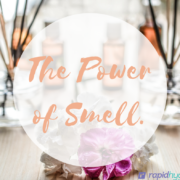 A pleasant smell that isn’t too over powering can influence the way that your customers react to your place of business. It is important that you select the right scent for your business type. Gender plays a role – generally, a female customer will prefer a washroom with floral feminine scent. On the other hand, more masculine scents appeal to men. 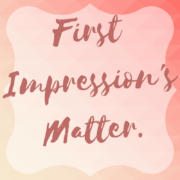 A smell can leave a positive first impression. Waiting rooms should smell fresh and welcoming. In a dental or medical practice, a fresh scent should be present, avoiding the sterile scent often found in medical centers. A fresh fragrance can help calm nervous patients in the waiting room. Again the chemical smell should be masked if possible. Bathrooms are a common place for odors and bad smell to rise and this can be very unpleasant for customers. So, it is important that you don’t simply mask the smell. A pleasant fragrance should not be over powering and should provide long-lasting freshness. Our air care products are specifically designed to disperse smaller and lighter particles which remain airborne for many hours proving long lasting freshness and reducing bad smell. If you are involved in the hotel and hospitality industry, keeping rooms and facilities nicely scented as guests arrive and depart can be a hassle especially when guests eat and smoke in rooms. In order to make your guests stay a memorable experience, you should consider choosing a unique fragrance to use over a longer period. After some time, this will become the signature fragrance that your guests will associate with their stay. Call us on 1800 92 77 92 and we will be happy to assist. Is Hygiene a priority for your business? https://www.rapidhygiene.com.au/wp-content/uploads/2017/09/400-logo.png 0 0 Rapid Hygiene https://www.rapidhygiene.com.au/wp-content/uploads/2017/09/400-logo.png Rapid Hygiene2017-06-30 12:28:442017-06-30 13:04:31Is Hygiene a priority for your business? https://www.rapidhygiene.com.au/wp-content/uploads/2017/09/400-logo.png 0 0 Rapid Hygiene https://www.rapidhygiene.com.au/wp-content/uploads/2017/09/400-logo.png Rapid Hygiene2017-06-01 13:23:122017-06-30 12:56:30Commercial Hygiene Tips!